1. Expert in manufacturing, controlling quality with over 10-year nail art experience of exporting and product inspecting by third party, such SGS. 2. Keep and update the capability to innovate and develop technology and products. 3. Strong sales and development teams work together, supported by productive factory in the procession of Heidelberg and automatic printing machines and branch office in HK and overseas offices in UK and USA. 4. 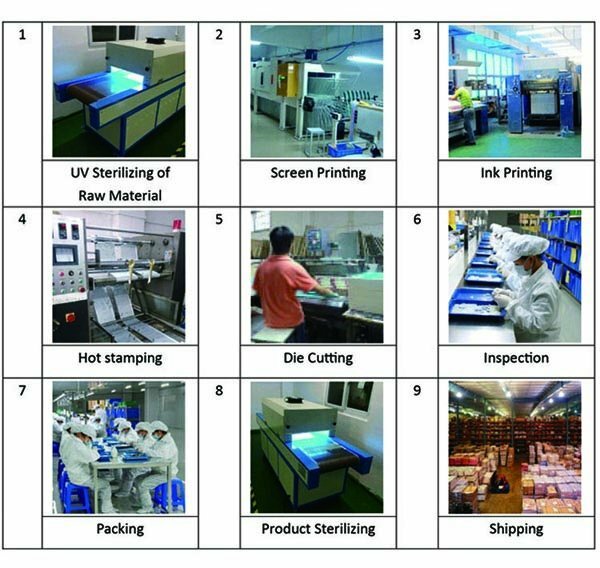 Strict with quality control and tests of raw material imported from overseas for catering for testing standard of every countries around the world. 5. Long-term authorized business relationship with Li Fung, Hello Kitty, Disney, Watsons, Walmart , etc, and designs and copyright of those have been protected always in NailSticker. T/T, WESTER UNION , Paypal. 1. How long do temporary tattoos last? Our temporary tattoos will last up 7-10 days. 3. How many tattoos should be packed in a carton? and the size of carton? 1000-1500 pcs/ctn , 265(L)*265(W)*170(H)mm , G.W: 4-6kg. 4. How much is a freight? Pls email to us about your address, postcode and quantities. We will reply you asap. 5. Is your nail sticker safe for pregnancy or children? Yes. We adopt environmental material for tattoo to make sure it is eco-friendly. Our product is formaldehyde, DBP (dibutyl phthalate) or toluene free. So, it is safe for pregnancy or children. 6. Do your products do any test? Yes. Our products pass test of CPSIA, CA65, EN71, FDA and TRA, especially including migration limits for 19 substances and 16P testing. 7. 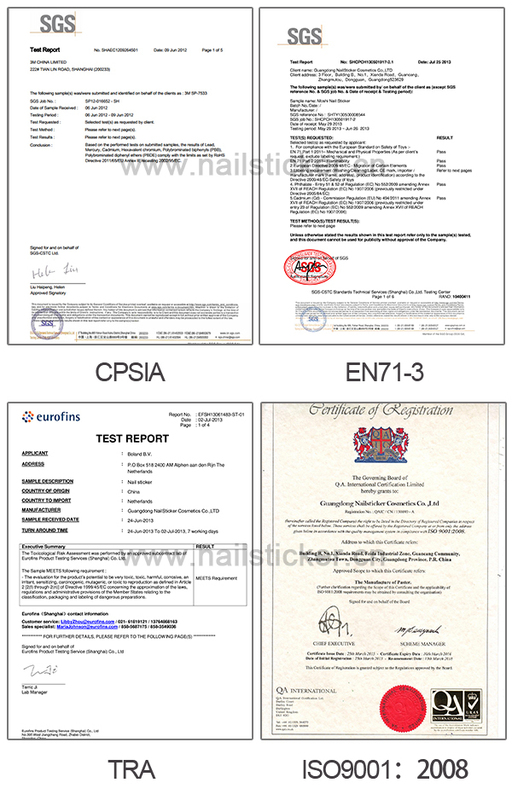 Is our product certificated? Yes. Our product is certificated by GMPC, ISO9001 and MSDS and SGS test report. 8. Could you accept OEM? Also the packaging? Sure. OEM is always welcome. Our company has worked with various famous brands. 9. If I don’t have any designs, but I have my own brand, could you provide your designs to us? Yes, ODM is viable. Guangdong NailStickers Co., Ltd has a strong team of designers. We try to update our designs for customers every month. If you don't have customized design, we are able to provide our design to you. 10. Do you have products in stock, as I need nail stickers badly? If yes, how should I pay to you? Yes. We have some fashion products in stock to sell anytime. Customers can pay via T/T or Paypal. 11. Will tattoos fade away in water? No, they won’t at the beginning. They are waterproof and are fine in the shower and the swimming pool. 12. Is the glue on nail stickers safe for health? Yes. The glue is eco-friendly and it won’t harm to health of nail. The glue passed the test of PAHS. 1 piece into a PP bag with a paper card header. Package can be customized. 1. Wholesale custom metallic body art temporary tattoos is perfect accessory to creatively express yourself. 2. You can accentuate your skin with shimmering dotted foil detailing or dress up any outfit with stunningshiny wholesale custom metallic body art temporary tattoos that you can mix and match for a captivating style. 3. Shiny water transfer metallic temporary tattoo will make you glow brighter than the moon! 5. Shiny custom metallic temporary tattoo will last between 7-10 days, which depends on the tattoo. 9. Safe and environment friendly. Formulated without Parabens, sulfates, Phthalates, DBP, Toluene and formaldehyde, etc. 10. Our factory is certificated by ISO9001:2008, GMPC, FDA and our products reach the standard of CA#65, CPSIA, EN71-3 (including 16P, 19 heavy metals, microbial contamination and TRA) and MSDS. 3. Place face of tattoo down on skin. 4. Wet the back of tattoo with water, dabbing with your wet finger, wet cloth or paper towel. 5. Do not rub and be gentle, or you will smudge your design and ensure entire backing is wet. 6. Leave for 5 minutes. 7. Remove backing and voila you have a shiny, flashy tidy tattoo jevellery piece. 1. We offer official quotation, MOQ and confirm delivery according to client’s requirements. 2. We can make pre-production sample/proof as per clients’ designs for approval before bulk. It takes a week for sample. We will preserve our clients’ copyright and interests. 3. Various packages are available for clients. We can pack products as per clients’ package details as well. 4. T/T payment, 30% deposit before production, 70% balance before shipment. 5. We can contact clients’ forwarder and arrange shipment. No worry about custom declaration and custom clearance. Established in 2002, Guangdong NailSticker Co., Ltd is a professional nail beauty products manufacturer specializing in designing, manufacturing, and distributing full range of decorative/cosmetics stickers such as Nail Stickers, Temporary Tattoos, RhinestoneStickers, Manicure Tools, Holiday/Promotional Gift Sets, Make-up and Bath Products, andFashion Accessories. 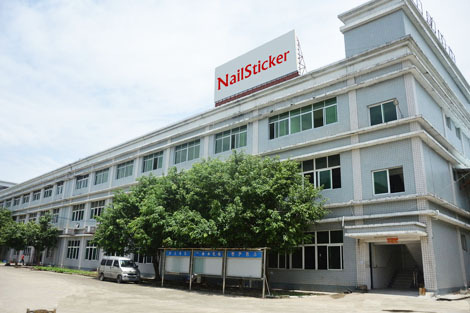 NailSticker maintains convenient transportation access with 2-hour-drive to both Guangzhou and HongHong and owns one factory(1000 m²) in Dongguan City and one sub-company (Tintark International Co.,LTD) in HongKong. Also, we have two oversea offices in California, US and London, UK.